TAMIYA 60314 MCDONNELL DOUGLAS F4EJ PHANTOM 2 JASDF (1/32) scale model kit! 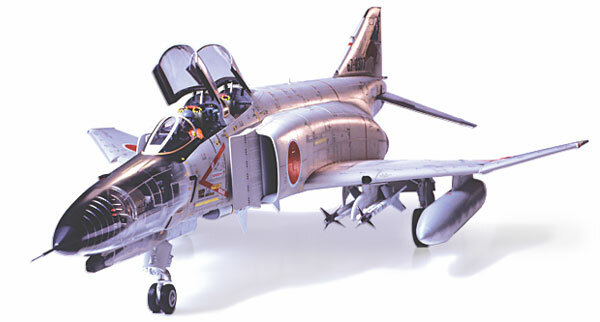 1-32 scale assembly kit of the F-4EJ Phantom II of the Japan Air Self Defense Force (JASDF) Overall length: 600mm, Overall width: 368mm. All unique aspects of the JASDF F-4EJ, including specially developed instrument panel, have been accurately reproduced. Large parts such as wings and fuselage are secured using small screws. Nose made from transparent parts allowing display of intricately detailed 20mm Vulcan gun and radar. Die-cast landing gear and synthetic rubber tires -4 sets of AIM-7E Sparrow medium-range and AIM-9L Sidewinder short-range missiles -2 pilot figures included -Markings for 10 planes representing all 6 JASDF squadrons. Skill level 3.